Throughout the year there is a quarterly art exhibit in Westminster Library. The exhibit is open to viewing during office hours and on Sundays. We host a forum with the artist during the exhibition. This coming Sunday, April 15th, directly after worship will be our next forum. Below is our current artists biography. We hope to see you there. 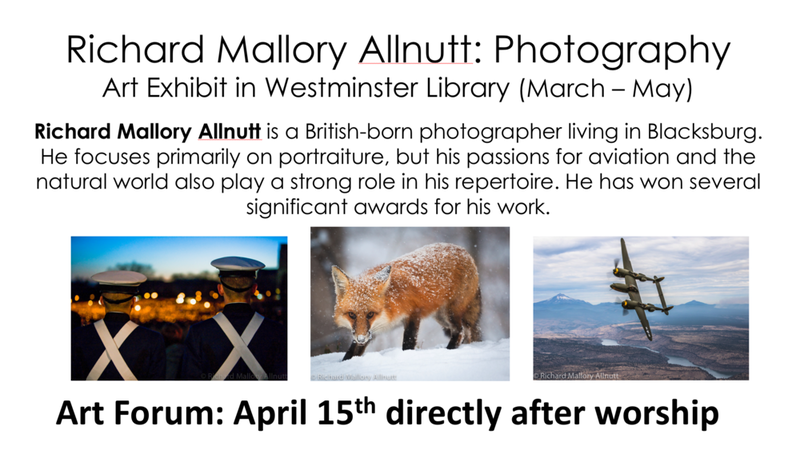 Richard Mallory Allnutt is a British-born photographer who lives in Blacksburg. He focuses primarily on portraiture, but his passions for aviation and the natural world also play a strong role in his repertoire. He has won several significant awards for his work, such as first prize in the 2016 Smithsonian Air & Space Magazine photography competition (Civil Aviation category), first prize in the FotoWeekDC International Awards Competition 2013 (Regional Focus category), ITVA-DC (stills section) and the prestigious Aviation Week & Space Technology photography competition. His images have graced the covers and pages of many books and magazines such as JazzTimes, Swing Journal, Smithsonian: Air & Space, and Brad Meltzer’s “Heroes for My Son”. Allnutt's clients include, among others, Dom Perignon Champagne, Moet Hennessy, Nike Communications, Virginia Tech, Concord Records, Telarc and Smithsonian Air & Space Magazine. He has also worked as a set photographer on several motion picture films. He divides his time primarily between Washington DC, New York City, Ottawa, Ontario and Blacksburg, Virginia.